Very nice manufactured home on .87 Ac. Look to North Carolina’s Badin Lake if you’re considering lake homes for sale. Located in the Piedmont region of the state, bordering Davidson, Montgomery, Stanley, and Rowan counties, Badin Lake offers premium recreation opportunities for locals and visitors alike. Reaching depths of around 190 feet in places, the lake’s deep blue waters and miles of unspoiled shoreline attract everyone from anglers to nature enthusiasts. Badin Lake is only one of several reservoirs that make up the Uwharrie Lakes Region of North Carolina, which was developed by the impoundment of the Yadkin–Pee Dee River. Unlike some of the other lakes in the area, Badin Lake is extensive in its size and breadth. A number of winding inlets, coves, and creeks contribute to 115 miles of largely undeveloped lake coast. The lake’s rich topography translates into supreme fishing conditions for anglers of all skill levels. Have your hooks baited and lines set to hunt for striped, white, black, and largemouth bass, in addition to catfish and crappie. Be prepared for a proper fight, though, because you’re likely to snag a record-breaking catch—these waters are home to the likes of 60-pound catfish and 20-pound striped bass. Scattered around the water’s edge are lake homes for sale with unparalleled views of Badin Lake’s forestry, sparkling waters, and stunning sunsets. With all these irresistible features beckoning you to join in the fun, it’s impossible to stay out of the water for long. Use the free-access boat ramp to launch your sailboat, powerboat, jet ski, raft, or kayak, and take to Badin’s 5,350 acres of open water. Boat across the center of the lake or explore the thickly wooded shallows. You’re likely to come across a secluded patch of beach along the way. Perhaps the best way to dry off from a day in the lake is to enjoy a leisurely hike. The Uwharrie National Forest, which borders Badin Lake, offers several hiking trails of varying difficulty. Trails like Dutchman's Creek and Denson's Creek place you in the thick of vibrant wilderness growth and indigenous wildlife. For a different view of the outdoors, head to any area golf course—several notable links are only a short drive from Lake Badin's lake-view properties. Courses like Badin Inn, Country Acres, and Old North State Club reward golfers with their challenging fairways and spectacular landscapes. If you’re interested in living on a Badin Lake golf course, visit GolfHomes.com for property listings. Did you know that Badin Lake can also make you rich? Whether you pan its waters for gold or simply revel in the priceless experiences this nature haven affords, you’ll love every minute you spend at Lake Badin. 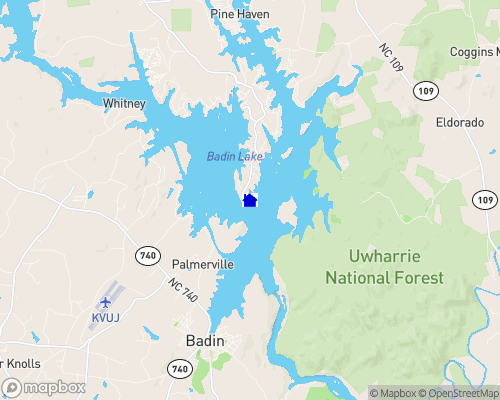 Badin lake is a 5,500 acre man-made lake bordered by the beautiful Uwharrie National Forest.